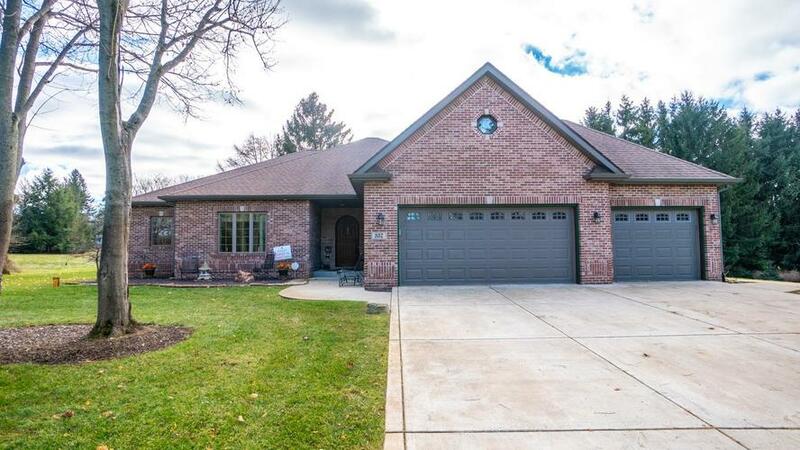 This beautiful ranch style home in Jackson Township is situated perfectly on a beautifully wooded lot! This home greats you with an amazing arched door that leads you into the home. The living room has a beautiful hand-scraped hardwood floor, floor to ceiling stone fireplace & a tall vaulted ceiling. The same flooring goes right into the master bedroom. Master bedroom has a walk-in closet & a master bath w/ a jacuzzi tub. The 2nd and 3rd bedrooms are large and they mirror each other. The main bath has a very nice tiled shower w/ a stone base. The kitchen is HUGE! There is nice cabinetry, some VIKING appliances, center island, tile floors & corner sink. Just off the kitchen is the most amazing 4 season rooms that over looks the wooded lot & brings in a ton of natural light. There is a big bonus room above the 3 CAR GARAGE! The bonus room could be a 4th bedroom, office or rec. area. Large unfinished basement too! The home comes with a whole house generator and much more! A must see! Directions:49 South to Route 6, East on Rt. 6 to 350 East, North to Tratebas Road and subdivision. Listing provided courtesy of Umbrella Real Estate LLC.